I previously focused on the work of Ecocity World Summit 2008 speaker Ken Yeang with this history of bioclimatic design and vegetated architecture. 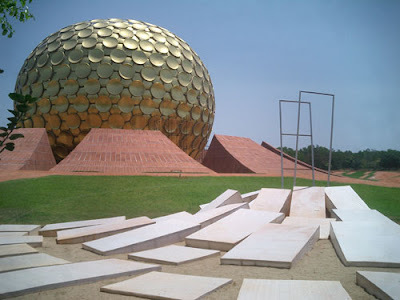 From this post, I recently recieved a heads up about another of the conference speakers, Lalit Bhati, and the community of Auroville - a perhaps too-good-to-be-true but still evolving along slice of utopia in southern India which, according to a profile from Mad Architect, is a: "..first step in creating a world where equality and harmony rules among people, disregarding the part of the Earth they are from, the language they speak or the color of their skin." The community has been steadily evolving, with a history that began in 1968, continually offering and expanding the range of sustainable options in addition to the social components. 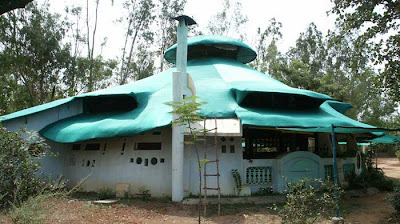 Via the Auroville website: "...building done in Auroville covers various aspects of architecture, and includes building materials, building technology, eco-friendly architecture, climate responsive designs, integration with natural surroundings, cost-effective buildings, geomancy and geometry, as well as the design of spaces themselves, including experimenting with the lifestyle of the user. There has also been spillover into the design and management of building infrastructure, the building of integrated rainwater harvesting systems, domestic waste water treatment plants and the integration of renewable energy systems for energy demands." Via Mad Architect: "Houses and buildings are spiraling around the center filled with green spaces, symbolizing the praises mother nature should receive for allowing us to enjoy its creations. The industrial areas are at the city’s periphery, leaving clean air for the center of the town, where the residential buildings will be located; pollution won’t affect anyone, so this would be one of the best places on Earth to raise your children - away from a big town’s squalor, growing in a natural environment, but still taking advantage of the modern technology." The central area, of 'soul of the city' is called Matrimandir. 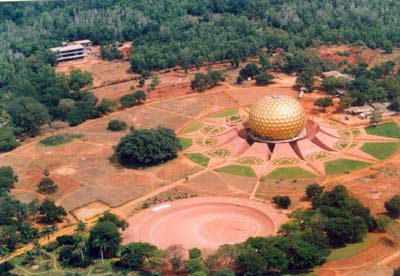 The symbolism is at the roof of the concept of Auroville: "The name 'Matrimandir' means literally 'Temple of the Mother'. According to Sri Aurobindo's teaching, the 'Mother' concept stands for the great evolutionary, conscious and intelligent principle of Life, the Universal Mother, - which seeks to help humanity move beyond its present limitations into the next step of its evolutionary adventure, the supramental consciousness." The gardens surrounding Matrimandir also provide this spirtual (but not religious) connective tissue for the city. 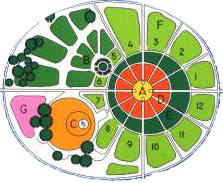 As mentioned on the Auroville website: "There are twelve gardens surrounding the structure, converging around it in the huge petal crown from which the Matrimandir arises. In 1969, when discussing the gardens, the Mother indicated that they would have to be of such quality and beauty that people visiting them would experience, physically and concretely, the significance of each garden." 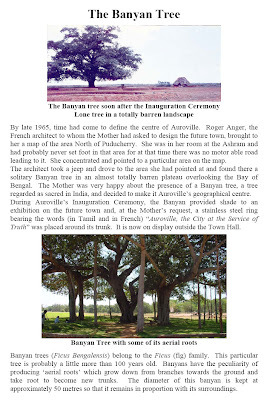 Gardens include ideas of: Existence, Consciousness, Bliss, Light, Life, Power, Wealth, Utility, Progress, Youth, Harmony, and Perfection - as well as other gardens - including on centered around the Banyan tree in the center of the Matrimandir- which is a Hindu symbol for 'eternal life'. The aerial prop roots evolve to provide a structural canopy that provides shade and comfort for residents. 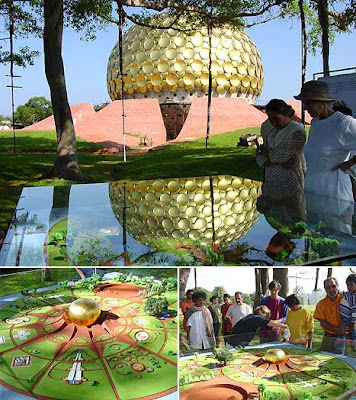 Auroville is designed to be a model eco-city for the future - and is interesting in providing not just a veneer of green but a vital and open social component of the process - which is often lost. There is a tacit assumption that if something is sustainable then it must be open and equitable. This is often true, but more often not. Does this hold true in Abu Dhabi or Dubai, UAE or Dongtan, China? Does eco-building in areas where limitations on personal freedoms become an oxymoron in these contexts? And not to the same extreme, but do our highly priced eco-towers and communities with such high costs make them essentially gated communities available to only the very rich? This often-missed third leg of sustainability, equity, needs to be considered in planning, building, commerce, -- all of our activities. As we become more global, more spread out, more homogenous - we become more connected, but also more implicated, in these world-wide issues - both the good and bad. As the recent Olympic torch relay protests have highlighted - even an institution meant to bring people together can become a forum to accentuate our issues, and possible create changes (or at least dialogue) for our social and cultural divides. Can eco-planning bring people together in green ways (the economic & environmental) as well as providing the much needed social equity we desire, but seldom acheive? 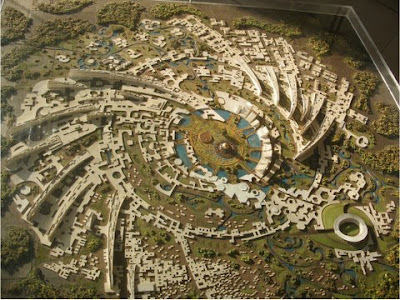 Maybe models like Auroville can provide some of the answers to inclusivity, and equity, we can actually see, and inhabit?